Definition at line 52 of file Debug.h. Definition at line 75 of file Debug.h. Referenced by clientNegotiateSSL(), Ftp::Server::handleRequest(), Adaptation::Ecap::Host::openDebug(), Security::NegotiationHistory::retrieveNegotiatedInfo(), ssl_ask_password(), and Security::PeerConnector::sslCrtvdHandleReply(). Definition at line 844 of file debug.cc. References _db_print(), Debug::Context::buf, Current, Debug::Context::forceAlert, and Debug::Context::upper. Referenced by _db_print_stderr(), Adaptation::Ecap::Host::closeDebug(), and SectionLevel(). Definition at line 858 of file debug.cc. Definition at line 91 of file Debug.h. Referenced by _db_print_stderr(), and debugLogTime(). Definition at line 459 of file debug.cc. References debugArg(), debugs, i, Levels, MAX_DEBUG_SECTIONS, NULL, p, w_space, xfree, and xstrdup. Referenced by _db_init(), _db_print_stderr(), mainHandleCommandLineOption(), sigusr2_handle(), and SquidMain(). Definition at line 93 of file Debug.h. References Current, Finish(), ForceAlert(), Debug::Context::level, Debug::Context::sectionLevel, and Ident::Start(). Referenced by ForceAlert(), and Raw::print(). Definition at line 823 of file debug.cc. References Debug::Context::buf, Debug::Context::Context(), Current, and Debug::Context::rewind(). Referenced by _db_print_stderr(), and Adaptation::Ecap::Host::openDebug(). Definition at line 81 of file Debug.h. Referenced by _db_rotate_log(), mainInitialize(), mainReconfigureFinish(), and parseConfigFileOrThrow(). Definition at line 103 of file Debug.h. Referenced by _db_print_stderr(), ctx_get_descr(), Finish(), ForceAlert(), Level(), Debug::Context::rewind(), SectionLevel(), and Start(). Definition at line 80 of file Debug.h. Referenced by mainInitialize(), mainReconfigureFinish(), parseConfigFileOrThrow(), PutEnvironment(), sigusr2_handle(), and snmp_confFn(). Definition at line 83 of file Debug.h. Referenced by _db_print_stderr(), testAuthConfig::create(), debugArg(), Enabled(), main(), parseOptions(), Debug::Context::rewind(), and testAuthUserRequest::scheme(). Definition at line 85 of file Debug.h. 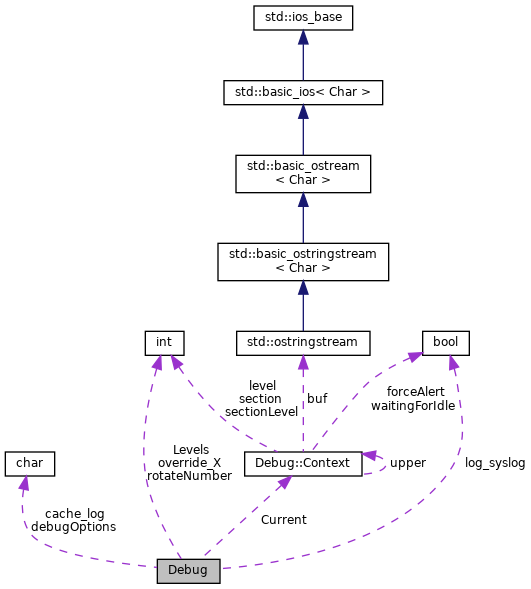 Referenced by _db_print_stderr(), mainHandleCommandLineOption(), and watch_child(). Definition at line 86 of file Debug.h. Referenced by _db_init(), _db_print_stderr(), and debugOpenLog(). Definition at line 84 of file Debug.h. Definition at line 82 of file Debug.h. Referenced by _db_rotate_log(), configDoConfigure(), and debugArg().